How Fast Does an Elephant Run? 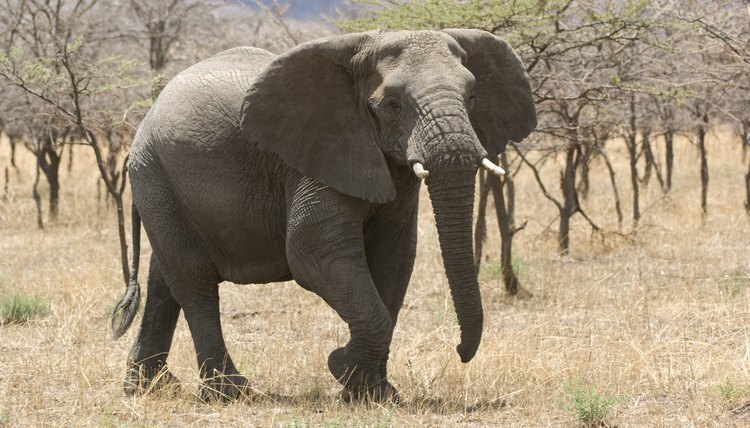 An elephant's running speed is limited by its enormous weight -- up to five tons -- and a height of up to 10 feet. A 2010 article published in the "Journal of Experimental Biology" put the maximum speed of an elephant at 5 meters per second, which translates to about 11.2 miles per hour. The research group, made up of scientists from Belgium, Italy and Thailand, conducted the study at the Thai Elephant Conservation Centre in Lampang, Thailand. They clocked 34 Asian elephants on a 164-foot track containing metal plates capable of measuring the elephant-generated forces. The researchers determined that fast-moving elephants don't really run, but rather possess a gait that is a mix of a walk and a trot. Elephants always have at least one foot on the ground, whereas running animals normally are airborne part of the time. Animals often change the pattern of their footfalls as they speed up. Elephants are different -- they maintain a continuous increase in step length and frequency as they speed up. The elephant's footfall sequence and limb relationships remain the same throughout its speed range. The research study found that elephants do add more pogo-stick bounce to their steps as they speed up. At the same time, the vertical movements of an elephant's center of mass decrease by 2/3 as it reaches maximum speed. The scientists determined that elephants output only about 1/3 of the average mass-specific mechanical work of other locomoting animals. The Journal of Experimental Biology: Biomechanics of Locomotion in Asian Elephants; J. J. Genin et al.